The plot thickened. And then it congealed. Did he just… siphon a power? Hard to tell exactly what’s happening, but it looks to me kinda like he’s chaining short-distance teleports. I was guessing Spider-Agility. Or, in this universe Flea-Agility I guess. Except Ron’s not moving like the Flea. He’s navigating the room in a way only the Flea could but he’s not moving LIKE someone with insect-based powers. I also sincerely doubt that it’s just a case of him being unused to the Flea’s powers assuming he copied the latter’s abilities. It’s hard to say. That white line could be motion blur from high-speed motion, but then, it could also just be a visual indicator for us readers as to the order in which he teleported. He could be clinging to the walls, or he could be kicking off of them. Except that Ron is not clinging to the walls- and if he’s kicking off them, not in the way the Flea or other insectoid/sticky supers would. He wouldn’t be posed in such manners (and consistently) in panel 2 if so. Rather, his stance (again, consistently) indicates walking and skipping from one plane/angle of wall to another. Well yeah, he’s kicking off of them, I was just talking about the Agility, not the wall climbing or any other of the myriad of powers insect-themed heroes tend to have. There’s got to be a way to express both under a single catchy, pithy term. It would seem the powers are related or parts of a single ability. This is actually a reply to Messenger, who somehow is not reply-able: Ron’s moves remind me of a scene from an early Sally Bollywood episode, in which Sally was trying to apprehend an antagonist in the school gym and her opponent was hurling a salvo of wrestling mats at her. She jumped from one mat to the next as they went past her in order to close in on the said antagonist. (The scene is also used in the title sequence. Yeah, I’m thinking power siphon, which would explain why Chuckles was passed out in the shop, his power was gone and it was a shock to his system. Most such powers are usually temporary, but for a while, Ron is a teleporter. This is the best description for Ron’s power here. A clue to consider alongside his recent catching of a ball bouncing between dimensions (2016-10-05). So he saw a path where there was none? He is going so fast there are multiple images of him to. That is just a perception problem. The frame rate is not high enough for him to show up in distinct locations. Earlier, we saw Ron perfectly detect where the ball was in a supernally difficult multi-card monte type deal. We also saw him execute perfect precision throws. Here, we’re seeing a perfectly-executed series of jumps to get exactly where he needs to be exactly when he needs to. It might actually be more powerful than Argosian abilities. Though imagine how terrifying it would be combined with them. And unless I’m mistaken – I think we saw him mess with Charles’ teleport of Flea, without knowing he was doing it. I am thinking that he might be behaving like a quantum particle: He could be anywhere in his zone of probability. This also means that is present everywhere he can interact with his environment, such as catching an inter-dimensional baseball or jumping from place to place but not being in-between (his wave form is not reinforced in those places). Atomic “particles” have particle-like and wave-like properties. Normally as we get to larger and larger, the wave-like properties tend to cancel out and you just get a great big particle. Ron still gets to show all the quantum properties, not just the particle-like ones. I’m uncertain about this, but: If Ron’s new abilities include an electron’s ability to be “somewhere in this volume defined by a probability function” and an electron’s dual wave/particle nature (look up electron diffraction in your favorite omnipedia), maybe the white blurs are when he’s a wave? Sorry, by the time I finished reading the rest of the posts, I forgot that David Nuttall had covered much of that already. It looks to me like he’s combing both Charles and the Fleas power. That is to say it looks like he’s teleporting and walking on walls. OMG !! An update !? This strip is labeled “2018-09-18”. The previous one was also “2018”. Clearly, Ron’s power is leaping through time, thereby allowing multiple-appearances in the Present. Actually looks more like super-speed and wall-climbing than teleportation. Note white blur in-between his images. This looks a lot like when Adem Warlock and Quasor and other Marvel Heroes use COSMIC AWARENESS in battle. Psst, just ignore the blue box fading out over there. Man, he still trying to drive with the parking brake on. I reckon it’s probability based – hence the card game earlier and being in all the possible places he could be (but somehow the most useful) here. Would also explain his supernatural bad luck. He THOUGHT it was Moonshadow, but what if it was Ron’s own unrecognised other power acting up? Oooo! Clever idea, I like it. How does it know which indefinite article to use (a or an) if he hasn’t cursed yet? Perhaps it’s covering up perfectly acceptable words on the mere assumption that he’s going to curse? Poor Zodon, he may have been misjudged all along! The chip is in his brain. It knows what he was intending to say. The censor word is clearly chosen to match the curseword that Zodon is trying to use; starting with a vowel sound if and only if replacing a curseword that also starts with a vowel sound. The ray is wearing off? Full strength yet partial abilities? Flying = walk on walls / speed = light blur speed like ability? Sight powers? Ron, his dad, and FISS don’t have any of Superman’s/DC’s flying brick extra powers. It’s really just Flight, Invulnerability, Strength, and Speed for him and other PS238-verse FISS. And the fact that he’s walking on walls rather than flying means he didn’t get flight (and the rest) back. Besides, there’d be no point to his conversation with Cecil revealing he still has other powers. It’d make Cecil’s conjecture wrong and thus unnecessary from a writing perspective. He could see under the cup before and that wasn’t anything new to him. He has super vision and it wasn’t removed by the beam. Because the beam, based on Argonite, was designed to remove FISS powers. Any vision powers Ron has, by definition, aren’t part of the FISS set. And, if so, it’s not something Atlas or any other FISS metas have. Remember Argo? The dog that was suped up with Argosian DNA? I’m pretty sure that Ul-ron and Mo-ron (and probably the rest of the house of Ron) have some super-senses to go along with their FISS set. I’m not sure if super senses would trigger Cecil’s radar, but this seems like it is definitely something new. You’re talking a dog, they already have enhanced senses compared to humans and its super-senses are pretty obviously a result of the augmentation from being gene-spliced with Argosian DNA. The Argosians themselves aren’t shown having super-senses. Adding to Nightmask’s point: not merely “obvious” but explicitly stated in ps238.nodwick.com/comic/07042007/. No other (human/humanoid) FISS has shown super senses of any sort. Except that, in his conversation with Cecil, there was no mention of “other” powers. Their conversation makes just as much sense whether Ron regains his original powers or gains entirely new ones. 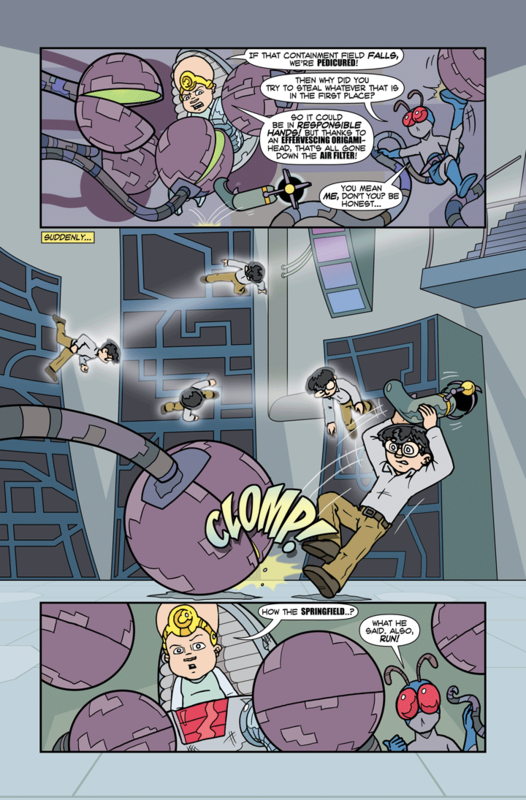 Insofar as Cecil still detects Ron as metahuman despite losing his FISS powers- for the purpose of being a viable hostage to Dex-Ra, and to the point of being kicked out of Praetorian academy- if Ron was just going to regain his FISS powers, it would have been pointless to have Cecil conjecture that he has powers from his mom and for Ron to afterwards happily wonder with Tyler what his new powers could be. That’s from a writing perspective. In-universe, you’d have to say that the Argonite laser- which works not just on powered Argosians but FISS in general (where 84 was affected by Argonite)- managed to blast FISS from Ron’s dad out of Ron but failed to remove FISS from Ron’s mom. That doesn’t make sense. Argonite and its laser derivative would only care if you’re FISS, not its particular hereditary source where Argosian or human FISS are the same to it. After a dive back into the archives, I can’t find anywhere that Cecil conjectures about Ron having powers from his mom, so if you have an issue and/or date for that please let me know. As for the “wondering” with Tyler, it starts with Tyler asking “So if you did get superpowers again, would you want the same ones?” After saying “I’m not sure”, Ron only notes that he likes powers that make you glow but NOT fire powers, followed by talking about a Praetorian with fire powers. It looks explicitly written to keep both options open, just like Cecil’s talk with Ron. As for in-universe, there is another option, which is that the Argonite laser was simply not permanent in its effects – a possibility that was left open in at least two conversations on Argos (Ul-Ron with the resistance leader and Dax-Ra with Ul-Ron). The best argument for Ron getting different powers is that what we’ve seen of him so far in this story that looked out of the ordinary – the cup game, catching the ball that came through the wormhole, interfering with Charles’ teleportation, and now the whatever-he-just-did to rescue the OOPS and its containment field – doesn’t seem to fit with the FISS power set. “Found” it. Quotation marks denote emphasis. It’s between the 05302014 and 06042014 updates- the page is missing (as noted in the first comment). I have the books but I’m at work now. I’ll type the dialogue when I get home. As for the laser’s effects possibly being temporary: 07082013. The artificial brain that made the weapon knew it would be permanent. The only reason Dex-Ra thought it wasn’t or had failed was because Ron, Moon Shadow, Atlas, and the Resistance tricked him into thinking they removal of powers wasn’t. With that and the current story arc, we have more reason to believe Ron’s FISS powers are truly gone, allowing for the emergence of his other mom-given powers. Garr. Missing pages play havoc with keeping up. Ah well, maybe this will get me to quit procrastinating and finally pick up the dead tree version. @Mike: The dead tree versions are worth it. Bold/emphasized words will be capitalized. Dialogue from the same character but with separate speech balloons are indicated by separate lines. Ron: I’m NOT? Really? But HOW? The argonite laser’s effect is PERMANENT, isn’t it? Cecil: Do I look like an expert on argonite lasers? Ron: I don’t know WHAT you look like. Cecil: Oh, right. Um, I mean, GOOD. Cecil: Anyway, based on my years of studying science fiction TV, movies, and books with a huge side order of comics, my theory is this: your alien dad gave you the powers you HAD, and THOSE got FRIED. But the super powers you MIGHT have someday came from your human mom and WEREN’T lasered out of you. Ron: That’s a pretty big guess. Cecil: I had help from this computer I know. He’s pretty smart. Ron: So what do I do? Cecil: You got me. I don’t know HOW powers get started, I only know you’ve got POTENTIAL. Cecil: Anyway, I gotta go. I have to landscape something before my dad freaks. Ron: Wait! Who are you? Off-panel voice (Tyler): Hey, Ron. The pretty smart computer Cecil mentioned would be Vance. Just so you know, Mike, pdfs are starting to show up on Drive Thru. Let’s try to encourage people to buy copies instead of downloading for free. After all, that’s how Aaron makes his living. You have no idea what Drive Thru is, do you? Oh, okay. Carry on, then. @Messenger – Yeah, that missing page changes the whole feel of the discussion. Now your take makes a lot more sense. I still go with quantum mechanics; “Gravity points in the direction I WANT it to point in!” But he’s not doing it consciously, yet. So, what’s up with his eyes? Hmm, who was the first superpowered guy he had contact with after Argos? I love how even the ‘metal pac man plants’ appear to be having a ‘WTF?’ moment in the last panel. Ron’s movement reminds me of classic video game characters–Super Ron, I mean Mario… With his success at Carnival Games earlier could this be the reveal of the Power Gamer tm? Yay, a power that makes him glow… just what he wanted.